This blog is more than an online magazine; it is our heart and soul right out there for you to explore. For us, it is the embodiment of our love for hospitality, the best expression of our creative spirit beyond the business arena. For you, it aspires to become a field of knowledge and entertainment. A creative platform to exchange ideas and head out for new discoveries. A creative guide on travel with destination specials and travel tips, on taste with fine dining proposals and recipes, on architecture and decoration, on recreation, on wellness and lifestyle. A set of everyday experiences sparking innovation. An avant premiere of upcoming events. A sneak preview of local secrets. A tribute to local communities. An interactive medium featuring your reviews and memories. 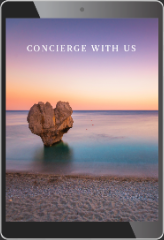 The joie de vivre of Mitsis Hotels and our latest news on a digital album. Unique Destination is a celebration of all that hospitality means to us, with absolute respect to our guests, your family and friends. A glass of wine delighting our hearts and inspiring our minds.